Manufacturers contemplating a move to oil-free air should first conduct a plant-wide compressed air system assessment to analyze demand patterns, supply capacity, and the system’s overall efficiency and effectiveness. This involves having an air audit done. During an air audit, such as that provided by C&B, a technician measures fluctuations in air supply and demand during each shift, over a period of several days. The technician taps into the main air lines during production and measures cfm, pressure and amp load. The audit consists of air flow measurements, energy and pressure recordings. At the completion of the audit, a report is compiled and recommendations provided for lowering energy costs, reducing wear on equipment, and increasing production efficiency. 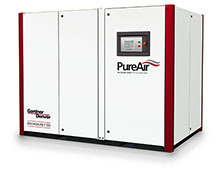 If the system assessment determines that a transition to oil-free air would be beneficial, it’s time to consult with a licensed distributor of oil-free air compressor systems to find the best solution to fit the application. Making the switch to oil-free air can require a significant investment. However, a properly configured system can offer a return on investment over time in the form of energy savings, reduced maintenance, and increased uptime and productivity. Considering making the move to oil-free air? C&B offers compressed air audits, and can help you find and implement the oil-free compressed air system that’s best for your application. Contact us today.